Hundreds gathered Sunday in downtown Riverhead to watch paddlers compete against each other in the Riverhead Cardboard Boat Race on the Peconic Riverfront. Due to the threat of rain the event was rescheduled from August 11. The popular event was organized by the Riverhead Business Improvement District. 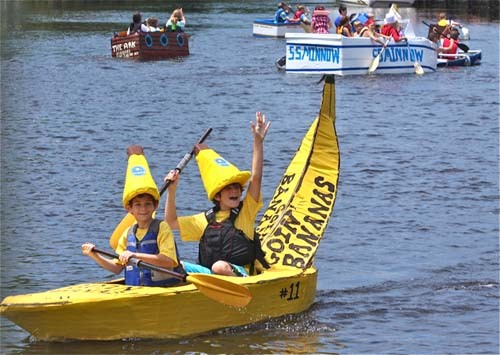 It’s time to collect that cardboard and duct tape for the ninth annual Riverhead Cardboard Boat Race, set for Sunday, Aug. 6, along the Peconic Riverfront. The first time I covered the Riverhead Cardboard Boat race was in 2013. A crowd of more than 1,500 people wrapped around the Peconic Riverfront on a sunny, hot Sunday in June. In a shady spot, I came across Patrick White wearing a baseball hat with a handmade seagull fastened to it. He was down on one knee, working furiously with a magic marker as he put the finishing touches on his first cardboard boat, The Poop Deck.